John Trimbur's much-cited 1991 essay, "Literacy and the Discourse of Crisis," persuasively argues for a view of literacy crisis discourse as "always strategic," and demonstrates the ways in which it has reified "the meritocratic educational order" (285-286). This project considers Trimbur's argument close to 25 years later, examining twenty-first century literacy crisis discourses immersed inextricably in a technological age. The notion of literacy crisis is a popular trope in the field of composition, rhetoric and literacy studies. Scholars such as Bronwyn T. Williams, Michele Knobel, Colin Lankshear, James Paul Gee, Cynthia L. Selfe and Gail Hawisher among many others have developed innovative heuristics in order to understand the nature of literacy learning in a digital age and enrich readers' understanding of the epistemologies underlying new literacy practices. However, this innovative book project considers the ways in which literacy crisis discourses have reinvented themselves in the twenty-first century through a richly textured view of these varied discourses. The contributors to this project contextualize their arguments by considering a variety of student writers through differing lenses. They interrogate widely circulating crisis tropes such as multitasking and hyper attention, plagiarism, needs for proceduracy literacy or demands for cultural literacy and decorum. They document and explore the braille literacy crisis, and the ever-present crisis of basic writing. Last, John Trimbur updates his argument at the close of the book, through an examination of historical, political, and economic pressures and fears, which inform literacy crisis tropes. Our digital era has deepened old fissures and generated new ones. Inequality persists. Nevertheless, each contributor expresses optimism and agrees that literacy practices in the digital age present real opportunities. They also argue that literacy crisis discourses in the Internet age, whether new or old, remain strategic. Lewis, Lynn C., Ed. 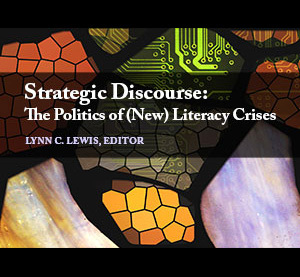 Strategic Discourse: The Politics of (New) Literacy Crises. Logan, UT: Computers and Composition Digital Press/Utah State University Press, 2015. Web. Copyright © 2015 Lynn C. Lewis and Utah State University Press/Computers and Composition Digital Press. Some rights reserved. For personal noncommercial use, readers may download/print a copy of the ebooks found on this site, and may link to this page. Readers may not reproduce this ebook or project, or display it on another web site. In no way does the above affect any of the following rights: fair use rights; the author's moral rights; rights other persons may have either in the work itself or in how the work is used.